The human eye is a sphere whose structures help to translate light bouncing off objects and recognize the object. Cornea, lens and retina are the parts through which light passes serially and reaches the retina via optic nerve, as it goes to the brain which interprets and identifies the object. Thus the shape of the eye plays a huge role in giving us vision. The normal eye focuses light on one point of retina called as focal point. However, in near sightedness the light is focused in front of retina and not on it. This makes it difficult to see distant objects and they appear blurred. A concave glass is used to correct this defect. In far sightedness, the light gets focused into an image behind the retina, making vision for near objects difficult and a convex lens is used to correct this deficit. 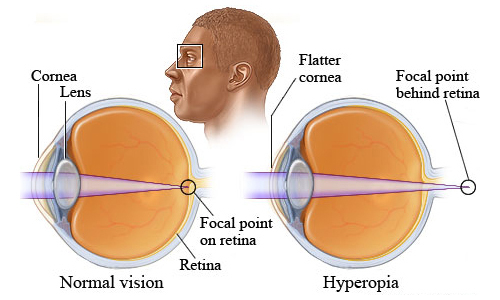 Near sightedness is also called as Myopia and it is seen commonly in children of 6-12 years age group. It is a defect of teens. A child may usually need new glasses every 12 months and it stops getting worse by the age of 20 as the growing period stops. Far sightedness, also known as hyperopia, also starts early in the age but normal growth corrects the problem. As we age, our eyes cannot adjust and focus the object on retina thus making it difficult to see nearby objects. It usually starts after the age of 40. This is termed as amblyopia and is due to stiffness of muscles of the eye that help in vision, not due to reduction in the diameter of the eye. The reason for these defects is the shape of the eyeball. When the shape of the eye becomes more oblong along its length, it causes light to focus in front of retina leading to near sightedness. When the diameter of the eye ball shortens the light rays fall behind retina leading to far sightedness. Thus the chief difference is in the shape of the eye. Near sighted people can see close objects clearly, but distant objects appear blurred. The first sign of this is observed in the classroom when the child cannot read the blackboard from a distance. They cannot see the television from far and when they read a book they have to hold it close. Squinting makes the far away objects appear clearer and one might find the child squinting to read as the first sign of near sightedness. On the other hand far sighted people can see objects at larger distances easily and clearly but they have problem in seeing closer objects. It is usually seen in adults and a strong family history is a known risk factor for it. Patients tend to have headaches on reading and complaint of eye strain. Near sightedness is corrected using concave eye glasses or suitable cotact lenses. It can also be corrected by reshaping the lens by an operation called as LASIK. A far sighted person just needs a reading glass with convex lenses to correct his vision. The option of contact lenses and surgery is also available. A consultation with an ophthalmologist is a must in the treatment of vision defect. People with near sightedness can develop retinal degeneration in rare cases and those wearing contact lens always have a risk of developing corneal infections and ulcers. However, in far sightedness, there is a risk of developing glaucoma if left untreated. Nearsightedness or myopia is a condition where the diameter of the eyeball increases leading to formation of images before the retina and thus causing blurred vision for distant objects. This is easily correctable by concave shaped glasses or contact lenses. Far sightedness or hyperopia or amblyopia leads to formation of images behind the retina leading to blurred vision for closeby objects. This is correctable by convex shaped lenses or surgery/contact lenses. rachita. "Difference between near sightedness and far sightedness." DifferenceBetween.net. January 14, 2015 < http://www.differencebetween.net/science/health/difference-between-near-sightedness-and-far-sightedness/ >.